The main hard disk vendors are Western Digital, Seagate, LaCie, Toshiba, ADATA, Hitachi, Samsung, and HP. In the world market the main leaders are Seagate (31%), Western Digital (30%), Hitachi (16%), and Toshiba (13%). All other hard disk manufacturers are satisfied with only 10%. In 2015, BlackBaze Company, which provides solutions for cloud backup, conducted and published the research on the reliability of hard disks that they use in their work. You can read the full text here — https://www.backblaze.com/blog/hard-drive-reliability-q4-2015/. Here only brief conclusions are gathered. The research is based on 55000 hard drives. The company mainly uses hard drives from Seagate (56%) and Hitachi (41%), WD disks are also used but their share is only 3%. The research revealed that the most reliable disks are Hitachi disks — the percentage of failed drives is 1-1.5% of disks per year. WD disks showed themselves slightly worse – about 3% of failed drives per year. And, finally, the most unreliable disks were disks from Seagate with a 4-25% percentage of broken disks. Such a large percentage interval is explained by the fact that for Seagate drives, the reliability strongly depends on the number of years in operation. One more curious research was done by a data recovery service. The report says that Hitachi disks are the most reliable and durable drives — the lion’s share of disk failures is associated with the improper operation rather than disk health. The most short-lived disks are Seagate disks. In addition, the research has revealed the «weak spots» of disks from different manufacturers. As for Seagate disks, most of the failures are associated with malfunction in the microprogram — first the disk starts to brake and finally it fails. In WD disks, a frequent malfunction is the failure of the disk heads, which typically happens as a result of disk overheating. A specific disease of Toshiba disks is jamming the axis of the motor due to a malfunction of the fluid bearing. 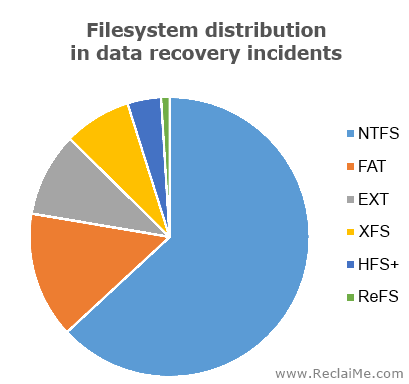 There is one more research affecting hard disk failures as to the filesystems used on the drives – what filesystem fails more often than others. This research was made by the data recovery company (www.ReclaiMe.com) developing data recovery algorithms, that is providing solutions for logical hard drives failures. The research involved 30,000 cases of logical damage and revealed that 50% of data loss cases are associated with NTFS. The modern file system Refs takes only 1%. File systems from Linux occupy about 18%, and MacOS filesystems — about 4%. Obviously, the distribution is such not due to the fact that NTFS is unreliable, but because it is still the most popular file system in the world. Are external drives more reliable than internal drives? An external hard drive is, in fact, an internal hard drive placed into a special box. It means that in external hard drives additional hardware is used. Therefore, an external hard drive has more parts which may fail. Another vote for greater reliability of internal disks is based on the fact that they are not portable — that is, you connect them to a motherboard and you have a sealed the PC unit. With external hard drives, you often connect them to and disconnect from a PC. Moreover, unlike internal hard drives, external hard drives are prone to falls. Copyright © 2011 - 2019 www.ReclaiMe.com.